I recently finished reading an excellent book: John Brown, Abolitionist, by David Reynolds. Since I had been steeped in so much history, and since the guys a HikingUpward had recently posted a new hike from Harpers Ferry up to Loudoun Heights via the AT, I figured it would be a good time to go visit. Spring has given way to Summer, and this was a scorcher of a day. I managed to completely luck out and get a parking spot at the downtown parking lot (something I can’t imagine will ever happen again,) and I set out. 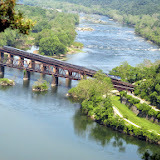 Harpers Ferry itself is almost entirely National Park, with most of the buildings serving as museums or commercial locations. I’m not sure anyone actually lives in the town, most people live nearby in Bolivar, WV. I followed the AT through down, passing by St. Peter’s church, the ruins of St. John’s church, and Jefferson Rock. You really can throw a rock and hit a historic site in this town. John Brown himself held the armory for several days in 1859, his fort is still standing and serves as a museum site, and is one of the more popular attractions in town. The day was really sweltering, and I was drenched in sweat for most of the hike, and I also had the unfortunate luck to forget my bandanna. Most of the hike was shady, but there were a few spots that were under the hot sun, and both I and my dog could feel the effects. Passing on the AT over the Route 340 bridge was one of these spots. The sun beat down, but the view of the Shenandoah River was quite nice, nice enough to make me want to go down for a swim. Then came the hill. Obviously, Loudoun Heights implies that it is indeed upon a hill, and so up a hill we went, following the AT on switchbacks, going up some cliffs above route 340, and along through the woods. I met a couple of day hikers, who asked me if I knew where the WV state line was. I confirmed on my GPS unit that it was along the Loudoun Heights trail, which was where I was headed, not far from where we’d met. At the Loudoun Heights trail, there was a bit of up and down, with a few bits of clover flowers and the ruins of some Civil War Era fort emplacements. It isn’t as well documented with signage as Maryland Heights on the opposite side of the gorge. As with the view from that side, this side was quite impressive, seeing the rivers merging together, and seeing all the buildings below like little toys. I had spied the two frozen custard stands on High Street, and when I made my way back into town, I stopped at The Coffee Mill and got some for myself and my dog. The prices were a little steep there, but it was totally worth it. The dog and I were both incredibly happy at the end. Posted in Hikes and tagged appalachian trail, battlefields, bolivar wv, civil war, dogs, harpers ferry, hiking, jefferson rock, john brown abolitionist, loudoun heights trail, maryland, national park, nature, outdoors, pets, photography, river, shenandoah, shenandoah river, summer, travel, virginia, walking, weather, west virginia. Bookmark the permalink.